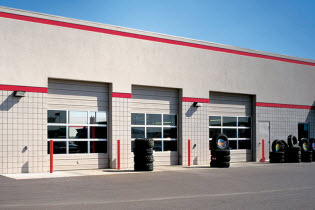 Overhead Door Corporation offers a wide selection of sectional steel and insulated steel doors to satisfy applications where durability, reliability and economy are top priorities. An array of door panel profiles, track and hardware, and specialized options allows you to further customize these doors to your specific project requirements. 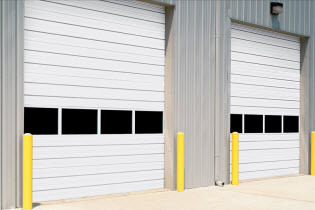 Non-insulated, strong, durable and versatile 16-gauge galvanized steel sectional door designed for heavy-duty commercial and industrial applications. 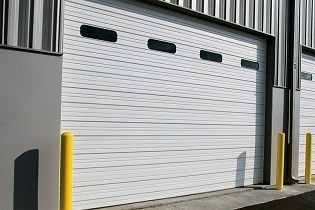 Insulated, high-quality, heavy-duty 16-gauge sectional door that provides protection against hot and cold environments. Non-insulated, strong, durable and versatile 20-gauge galvanized steel sectional door designed for heavy-duty commercial and industrial applications. Insulated, heavy-duty 20-gauge sectional door designed for applications requiring protection against the elements. Non-insulated, strong, durable and versatile 24-gauge galvanized steel sectional door designed for heavy-duty commercial and industrial applications. Insulated, heavy-duty 24-gauge sectional door designed for applications requiring protection against the elements. Non-insulated, nominal 24-gauge galvanized steel sectional door designed for medium duty applications. Insulated sectional door, nominal 24-gauge ribbed galvanized steel, economical solution for medium-duty applications. The insulated sectional steel door model 418 is a high-quality, heavy-duty door that provides protection against hot and cold environments. Fabricated of 16-gauge, flush galvanized steel exterior, these 2" (51 mm) thick doors offer an R-value of 7.35. A wide array of options allow these doors to meet the most stringent project requirements that call for a degree of thermal efficiency. 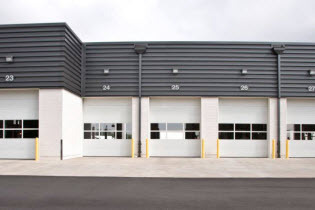 The insulated sectional steel door model 422 is ideal for heavy-duty applications requiring protection against the elements. These doors feature a 2" (51 mm) panel thickness with 7.35 R-value and 20-gauge ribbed steel exterior. A multitude of options allow these insulated heavy-duty doors to be used in a variety of commercial and industrial applications. 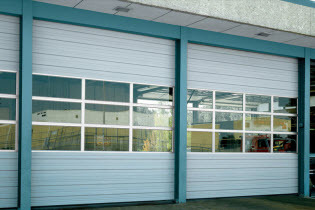 The insulated sectional steel door model 426 are ideal for heavy-duty applications requiring protection against the elements. These doors feature a 2" (51 mm) panel thickness with 7.35 R-value and 24-gauge ribbed steel exterior. 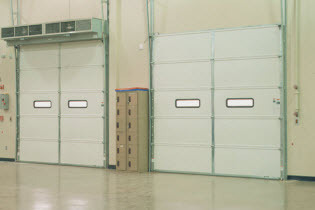 A multitude of options allow these insulated heavy-duty doors to be used in a variety of commercial and industrial applications. 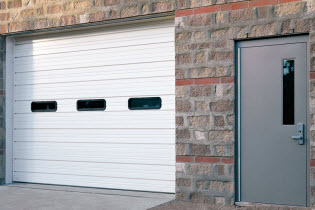 The insulated sectional steel door model 432 offers a 2" (51 mm) panel thickness, a nominal 24-gauge ribbed galvanized steel exterior and a poly-bonded back cover. Polystyrene insulation provides an R-value of 7.35. A variety of options make this door an economical solution for applications requiring a medium-duty insulated steel door. The non-insulated sectional steel door model 416 feature flush panel designs that are strong, durable and versatile. Featuring 16-gauge galvanized steel these doors are designed for heavy-duty commercial and industrial applications, these doors also offer many optional features that allow you to make a bold design statement without compromising functionality. The non-insulated sectional steel door model 420 feature a ribbed exterior and are strong, durable and versatile. Featuring 20-gauge galvanized steel these doors are designed for heavy-duty commercial and industrial applications, these doors also offer many optional features that allow for meeting nearly any project requirement. The non-insulated sectional steel door model 424 feature a ribbed exterior and are strong, durable and versatile. Featuring 24-gauge galvanized steel these doors are designed for heavy-duty commercial and industrial applications, these doors also offer many optional features that allow for meeting nearly any project requirement. 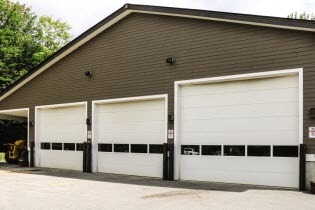 The non-insulated sectional steel door model 430 is available in sizes up to 20'2" in width and 16'1" in height for a variety of medium-duty applications. These doors feature a 2" (51 mm) panel thickness and a nominal 24-gauge ribbed, white galvanized steel exterior. The 430 Series is customizable to any project specification and offers a variety of available options. Glazing choices include DSB glass, plexiglas, tempered glass, clear lexan, wire glass and polycarbonate.